'Perhaps, in the whole circle of the arts, there is not one profession so useful, and requiring the exercise of so much ingenuity, in which so few tools are employed, as in that of the Tailor. 1669 Plymouth and West Devon Record Office hold a lease in which Richard Tuckerman of Ashburton, tailor, was one party to a 99 year lease of a cottage at Southbrooke, Buckland in the Moor. 1736 Devon Record Office holds documents concerning the settlement of William May, tailor, his wife Mary and two children. 1752. William Bickford, the son of Nathaniel, was apprenticed to Solomon Earle, tailor, in Ashburton. He paid a premium of £6 6s. In 1760 Richard Aunger Jnr., of Ashburton, taylor, was summoned to appear at the Quarter Sessions to be assessed for the maintenance of a child born to Ann Daymond - the child was likely to be a charge on Chagford parish. Richard Aunger Snr., of Holy Trinity in Exeter, taylor, and Solomon Earle of Ashburton, taylor, gave sureties. April 1791. The London Metropolitan Archives has a record of William Cook of Ashburton, tailor and salesman, being insured. 1792 John Smerdon was apprenticed to William Eales, tailor, Ashburton. 1822 Devon Record Office holds a settlement examination of William Leaman, a tailor of Ashburton. At 11 years old he was apprenticed to John Eales of Highweek, tailor. 1838 Robert Gale, tailor, was one party to the conveyance of premises which were part of the manor of Ringmore. Mr Philips married Harriet Ferris in May 1839. Harriet was the second daughter of Mr T Ferris Jun., tailor. In 1846 Richard Wills was found guilty of obtaining leggings and breeches by false pretences. from John Husson, tailor. Wills, who worked for Mr Irish, told Mr Husson that his employer would pay for them, and brought a note allegedly signed by Mr Irish. The prisoner was sentenced to two years - he said that he would rather be transported. In August 1850 at Ashburton Mr Thomas Norris, tailor, married Mary Ireland Baker, the eldest daughter of C Baker, a builder. In 1851 Roger Glanvill, 69, and his wife Susanna, 70, were living in West Street. Their 41 year old unmarried son, Richard was living with them - he was a master tailor. All three had been born in Ashburton. Robert Bowden was baptised in June 1806, the son of John and Sarah. In September 1828 a Robert Bowden married Mary Preston. Both were of the parish. In 1856 Sarah Honeywill sent a letter to her son William, mentioning that Sarah Bowden the tailor's daughter got married and has got one child. Sarah Ann Bowden had married George Wills Hill in April 1855, and on the marriage certificate her father is named as Robert Bowden, tailor. A John Bowden was one of the witnesses. For more on Sarah Honeywill's letter see People and Properties 1800s. In the 1861 census 54 year old Robert Bowden was a master tailor and dairyman, living in East Street. With him was his wife Mary, 'superintendant of dairy', his married son John, who was also a tailor, and his daughter Mary J, who was a dairymaid. All of them were born in Ashburton. Robert employed 2 men. John Bowden may have been the John Bowden, tailor, who gave evidence in a case of assault in 1850. John Trist summoned George Rowell: Mr Trist had called Mr Rowell names, and the latter had retaliated. The names called, 'Charlotte' and 'Old Bull' referred to the fact that George Rowell had made a servant of his, Charlotte, pregnant, and had then dismissed her. A William Bowden, tailor, was living in Aldershot in 1871. Aged 49, (therefore born circa 1821/22) he was living with his wife Mary and children Elizabeth, William and Henry. All the children had been born in Ireland; William Snr had been born in Ashburton. William and Mary A were still in Aldershot in 1891, with their 14 year old daughter Ada, who had been born in Ireland. William was a retired tailor. Familysearch has a record for Ada Louise Bowden, born in Dublin in December 1876, with parents William Bowden and Mary Anne Bowden Tyrrell. William Bowden married Mary Ann Tyrrell in the Brighton district in the June quarter of 1859. A transcription of the marriage shows William's father to be John Bowden. William Snr's baptism could have been in April 1820 at Great Meeting, the son of John and Elizabeth. Other children of John and Elizabeth appear to be: Elizabeth, 1823; and Thomas Henry William Bowden, 1825 (Whiddon rather than William in one transcription). The 1841 census, which is difficult to read, has John Bowden aged circa 40, a tanner (?) and his wife Elizabeth, of roughly the same age, who appears to be a serge worker. In 1861, where the ages are not rounded down, John, a tanner's labourer, is 60, and his wife Elizabeth is 64. In 1851 a William Bowden, tanner, and his wife Joanna, are living in Bermondsey, Surrey. William is 29 (therefore born circa 1821/22) and was born in Ashburton. He is not necessarily the son of John the tanner, but there is the continuity of occupation. However, John and Elizabeth use the slightly unusual name Henry in one of their son's names, and William the tailor also calls one of his sons Henry. Another possibility for William's baptism is in August 1821, the son of John Butchers Bowden and Mary. John is a husbandman. Other children of John and Mary appear to be: John, 1823; Mary, 1824; John, 1826; and Anna, 1829. William Bowden was baptised in Chiselhurst, Kent, on January 21st, 1835, the son of William and Elizabeth. In 1861 in St Lawrence Lane 26 year old William Bowden was a tailor, living with his mother Elizabeth, who was a butler's wife. William's two sisters, Jane A and Mary A A, were also in the household, together with a grandson of Elizabeth's, two year old John Harding. Both Jane and Mary were dressmakers. William had been born in Chislehurst, in Kent. Paddon and Ward, drapers of Ashburton and Tavistock, were amongst the notices of partnerships dissolved in the Draper and clothier, 1860. Albert Boynes - 16 year old Albert lived in North Street. Samuel Chubb - aged 12, Samuel was an apprentice tailor. James Chudleigh - an apprentice tailor living at 5 Caton. He was 18 years old. Henry Coleman - 43 year old Henry was a tailor in West Street. Enoch Coleman - Henry Coleman's son. He was an apprentice tailor aged 19. Johannah Cornelious - Johannah, who lived in Browses Buildings, was a tailoress. Her husband was an ag lab. William K Edgcombe - Born in Ashburton, William was a tailor and L and W draper (?) in North Street. Richard Edgcombe - 38 year old Richard was a master tailor in East Street. Thomas Ferris - was a tailor and draper employing 2 men and 3 boys. Henry Foot - 42 year old Henry lived in West Street, with his wife Elizabeth L, 'tailor's wife'. Richard Ford - aged 14, and grandson of another Richard, he was a tailor's apprentice. Richard Glanvill - was a tailor and draper in West Street. James Waldron (below) was in the same household. 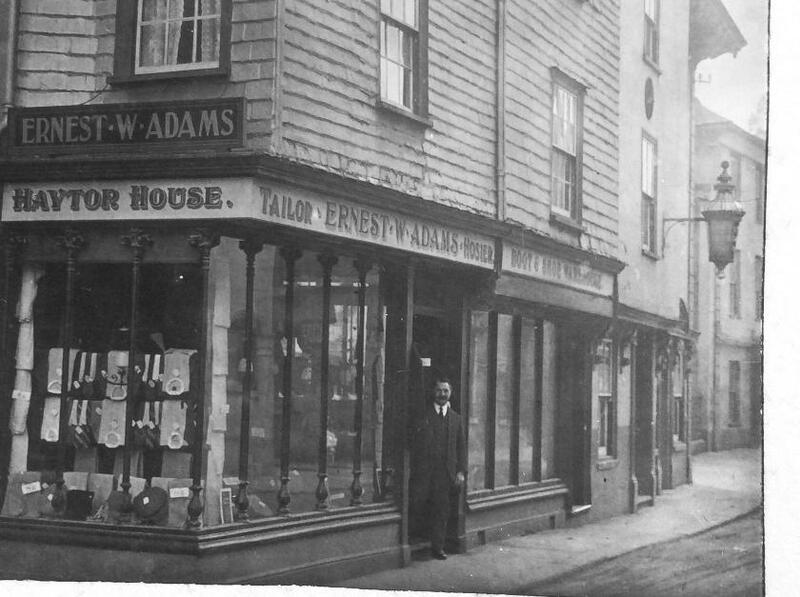 Thomas Hannaford - born in Totnes, Thomas Hannaford was tailor living in Back Lane. John Husson - 43 year old John was a tailor and draper in North Street. One of his sons, Edward, was also a draper. John Ireland - was lodging in the Golden Fleece at the time of the census. He had been born in Ashburton. William Leaman - aged 15. His father was an ag lab, and his mother a laundress. Frederick Matterface - an apprentice tailor aged 17, living in East Street. His father was a butcher. William Nish - an apprentice tailor, William was lodging in St Lawrence Lane. 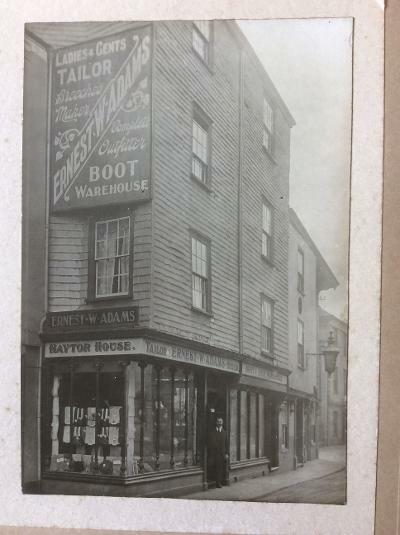 George H Rapsey - a master tailor living in West Street, George had one apprentice. Peter Smerdon - was a tailor living at 2, Bickington village. John J A H Smerdon - an apprentice tailor. His father, another John, was a post office messenger and bootmaker. William Taprell - 64 year old William lived in North Street. John Tennott - 61 year old John was lodging in Browses Buildings. Richard Thorn - a 12 year old apprentice tailor, living with his family at the London Inn. James Waldron - was a 17 year old apprentice tailor, in the household of tailor and draper Richard Glanvill. Michael Walsh - originally from County Waterford, Michael was lodging in North Street. James Yolland - 32 year old James was a tailor and draper in North Street, living there with his wife and widowed mother Susana, a fundholder. 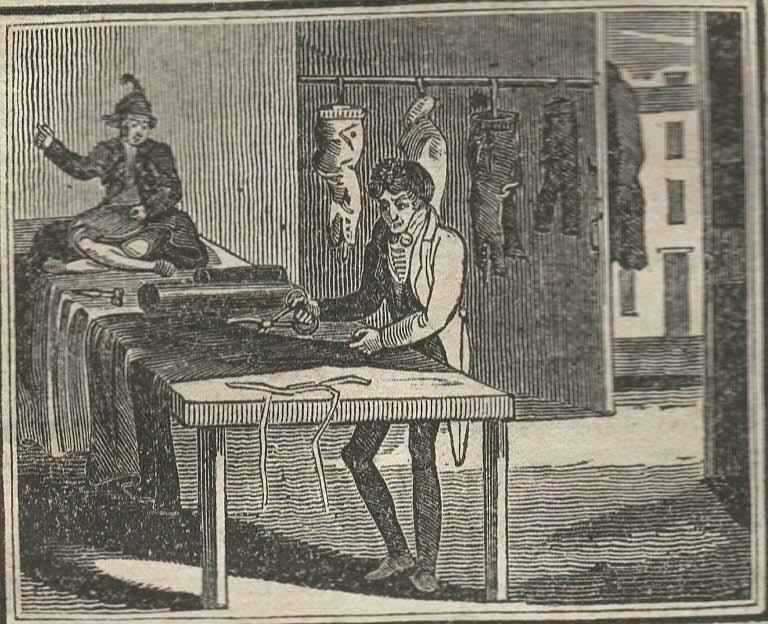 Amongst the list of bankrupts in the London Gazette on 30 August 1861 was Thomas Ferris, tailor and draper, Ashburton. A premises for sale or let was advertised in East Street in 1862. The building comprised a spacious house, a large modern shop, and cellars. It had been used as a tailoring and drapers business for some years. William B Ward, linen draper, is living in West Street at the time of the 1861 census. He has a wife, Anne, and three young children, and keeps two servants. 1874 William B Ward, of Ashburton, was one of those sworn onto the Grand Jury in Exeter. In the 1891 census 62 year old William B Ward was a draper in West St, living there with his wife Ann and his daughter Beatrice E. William had been born in Jacobstowe, Devon. 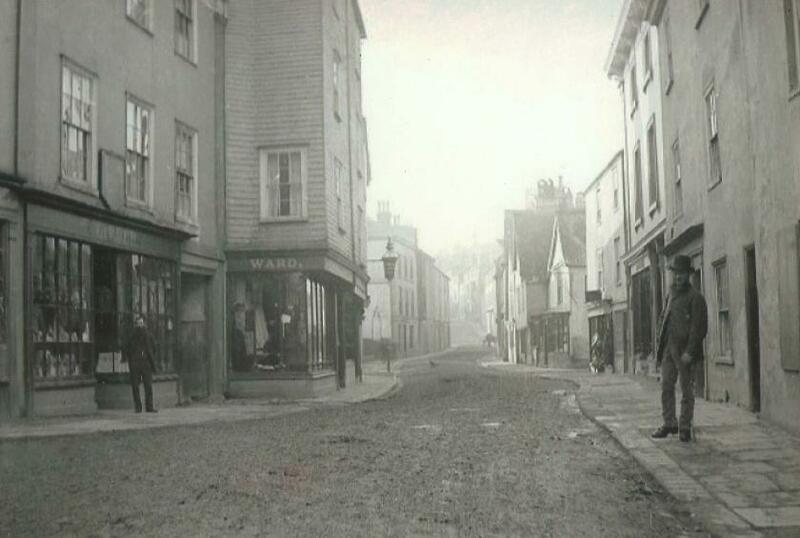 By 1901 William had retired, and was living with wife Jane E and daughter Beatrice in Hillsborough Avenue, Exeter. In 1891 John Payne, aged 23, tailor, was found guilty of stealing an ox from Samuel Winsor. He was sentenced to two months' imprisonment with hard labour. There was a disturbance ('more like a riot') after a political meeting in Ashburton in 1892 in support of Mr Collins, the conservative candidate. Four youths were charged with assaulting John Henry Mitchelmore, a tailor's cutter, when they threw lime and sand at Mr Michelmore as he left the Market Hall. 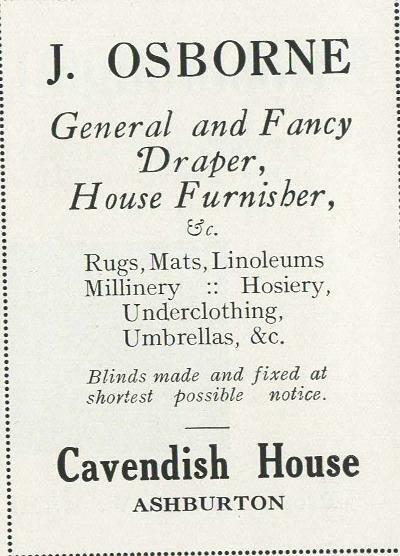 A K Easterbrook, tailor, was advertising for a coat hand in 1900, promising 'constant employment'. James Henry Mitchelmore of East Street, tailor, was also listed. John Henry Ford of North Street, draper, was also qualifed to serve as a juror. Above: In the 1901 census 29 year old Abraham K Easterbrook was a tailor and outfitter, living with his wife and three daughters in West St.
James Parish, 18, was an apprentice living with the household. In 1905 the Exeter and Plymouth Gazette headed an item 'Trouble among the tailors.' Abraham Kivell Easterbrook sued Frederick Eli Rodgman for £50 damages, for breaking an agreement not to carry on business as a tailor. Mr Rodgman had worked as a cutter for Mr Easterbrook, and on leaving his employment had allegedly agreed not to set up in business within 10 miles of Ashburton for 10 years. The case hinged on whether Mr Rodgman had left voluntarily, and as there was some confusion about this, judgment was awarded to the defendant. In the 1911 census 25 year old John Henry Easterbrook is a tailor, outfitter and boot dealer, living at Haytor House, West Street. His wife Nellie Mary, and his mother Elizabeth Ann are with him. Both John Henry and his mother were born in Widecombe. John Osborne and family were living at 8 North Street at the time of the 1911 census. 45 year old John was a draper who had been born in Pensilva, Cornwall. John Osborne, previously an Ashburton draper, died in Paignton at the end of 1939. He had served on the Urban District Council for a number of years, had been a sideman at the church, and was portreeve from 1917 to 1918. J H Easterbrook was selling Haytor House in 1921. It was advertised as a large double-fronted shop with a 36 foot frontage, with a dwelling house of 12 rooms. Ernest may be the Ernest W H Adams who was 6 years old on the 1871 census, the son of Walter H Adams, a tailor. Ernest was born in Bristol, where the family were living at the time of the census. 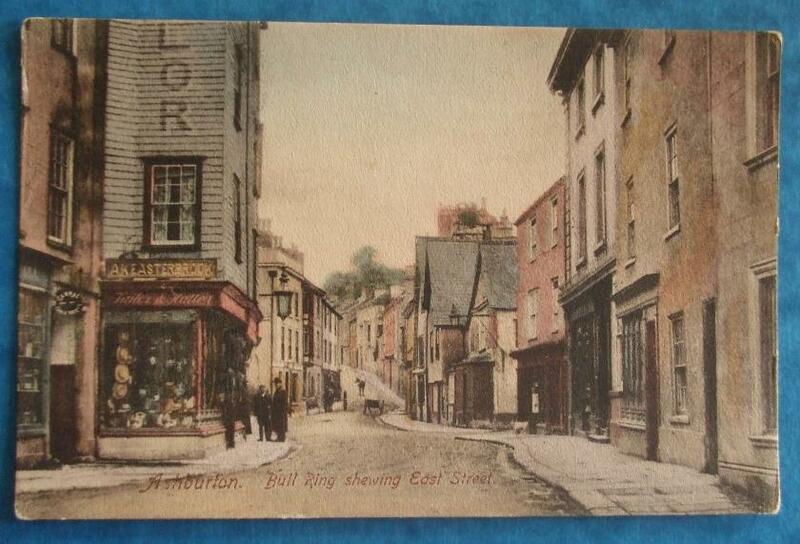 In November 1931 Adams, at Haytor House, was advertising a 'Commodious business premises' for sale in the centre of Ashburton. 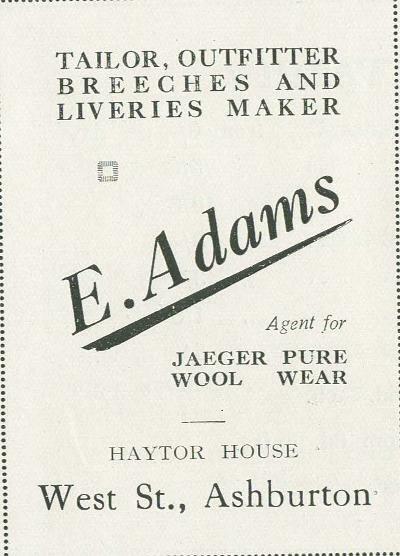 On the 14th November, Rendell and Sawdye had received instructions from Mr E W Adams to sell his stock of clothing: men's, boys' and youths' suits, overcoats, breeches, sports coats, woollen items, golf hose, shirts, hats and caps etc. Mr Adams was leaving the town. 1926 The Devon Record Office has a death certificate for William John Chard of Ashburton, retired tailor. It seems likely that William was the father of Harold Walter Chard, who was a watchmaker and jeweller in North Street during the 1920s. In the 1901 census William is shown as a tailor in Honiton, which is where he seems to have spent most of his life.